Coast & Country pride themselves on providing the best possible standard of workmanship. The exterior of your property is the window to the outside world and we are very proud of the quality work we produce. From painting masonry walls to black steel Rejas, treating wooden beams and glossing windows and doors, the finished result will show your property to its full potential and will protect the building well into the future. Specializing in the complete exterior house decoration and villa repair service, Coast & Country will meticulously prepare your property before painting (power washing to remove loose and flaking paint). The best results are achieved by comprehensive preparation - this gives you the best value for money as the finished result will last much longer. We believe this is absolutely essential prior to painting. We meticulously prepare your property before painting to get the best results possible and produce a finish that will last that much longer. Unless surfaces are treated correctly they will result in peeling and flaking. We apply an Acrylic resin spray coat that transforms the surface into a rock hard undercoat ready for painting. We offer a full terrace and patio service from a brand new design and install through to patio repairs (broken/cracked tiles) and waterproofing / slip proofing. 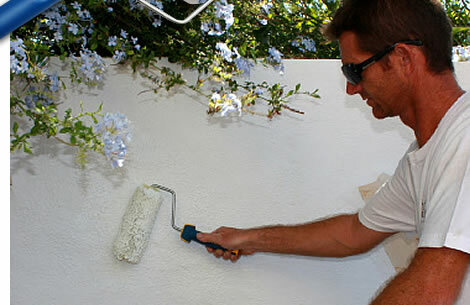 Prior to painting we prepare and repair all surfaces that are damaged. This includes all sand and cement plastering repairs (smooth or rough cast) either interiors or exterior. We can carry out all types of tile replacement and repairs as well as offering an extensive flat roof treatment and waterproofing service. We offer an interior decoration service which can totally transform your living space whilst keeping personality and style, using the finest paint products.